Span the bolt opening of a rifle, usually attaching to the bridge and receiver of the rifle with two screws each in front and back. These mounts are designed specifically to fit only one action length, be it short, medium or magnum calibres. 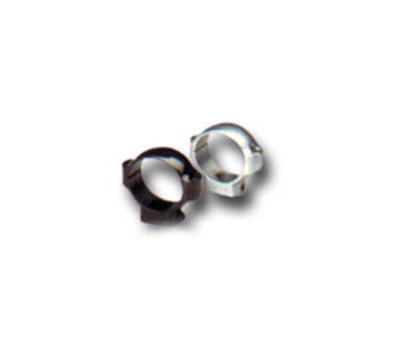 1 Inch (25.4mm) Rings for scopes with 1-Inch maintubes. Available in three heights: Low (7.60mm from base to scope tube), medium (12.65mm) and high (15.75mm). Also in three finishes: Satin chrome, matt black and glossy black. 30mm Rings for scopes with 30mm maintubes. Available in three heights: Low (7.6mm from base to scope tube), medium (12.65mm) and high (15.75mm). Also in three finishes: Satin chrome, matt black and glossy black. Fit directly on to rifles with dovetailed recievers. Available in three heights: Low (7.6mm from top of action to scope tube), medium (12.65mm) and high (15.75mm). Measurements are now noted for the height of the rings.